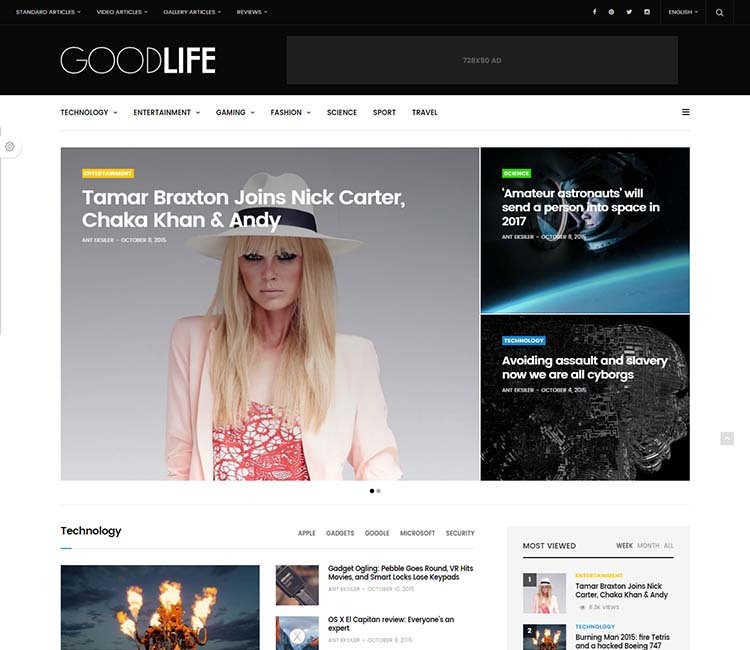 In this scandalous round-up, we expose the best celebrity and gossip magazine themes for WordPress in 2019. 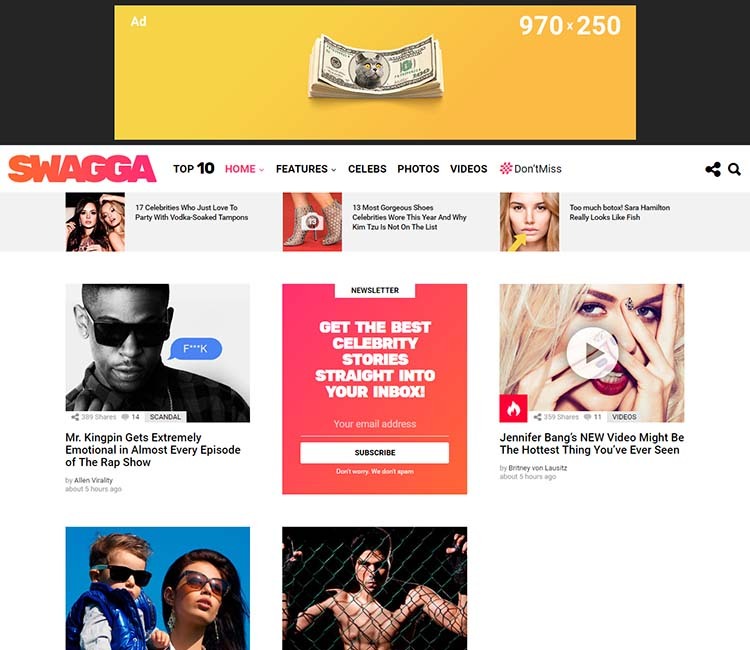 Those of you looking to start you own TMZ-like celebrity & entertainment news website can get a great-looking, inexpensive head start by installing one of the themes on this list. 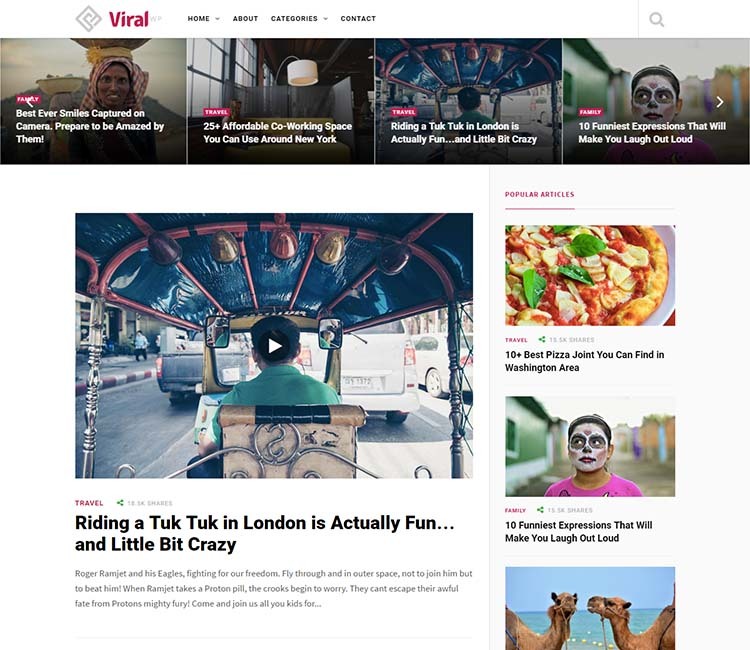 For the most part, we set our sites on bright, fun themes with strong viral and sharing features. None of these themes are blatant clones of other popular entertainment and gossip websites like TMZ or E! Online, but each embrace a familiar aesthetic and occupy a similar space, both visually and on the user-experience (UX) level. Content may be king, but the success and profitability of a gossip website depends on traffic, traffic, traffic. Social engagement and a top spot in Google are paramount. Half-assed, under-optimized code isn’t going to cut it. To keep our selections as fresh as possible, we intentionally omitted themes from the list that were several years old. At the time of publication, none of these themes were much older than one year. Of course, that means there were some gorgeous, featured-packed products from several years back that didn’t make the cut–but to make sure that the coding is up to snuff with current Google demands and social sharing habits, freshness seemed like the way to go. Alright, let’s dig into the list. It’s not always the case, when putting these articles together, that a clear winner emerges. But our top spot this time was a no-brainer: Hush. First off, Hush perfectly looks the part. It’s reminiscent of many high-profile celebrity and gossip websites (without being an explicit ripoff of any particular one). Secondly, it includes all the features you need to build a high traffic, profitable celebrity & gossip website along the lines of TMZ or E! Online. It’s versatile, coming with a wide array of theme options and layout variations. Hush includes Visual Composer for front-end page building. Users can create reviews along with their article content. Hush supports a variety of the most popular commenting engines like Disqus. Above average advertising features will aid in your monetization efforts. Hush is fast and performance optimized. The scores a 98% on Google’s page speed tool and 90% of YSlow. SEO optimization is state-of-the-art, with schema integration and structured data markup. It’s critically important for gossip sites to rank well on Google. Highly recommended. We like our next pick, Click Mag, almost as much as Hush. Click Mag shares a lot of the same features as Hush, including WooCommerce support for shopping cart functionality. You’ll also find bbPress support for building a forum and community. Reviewer Plugin is bundled (that’s the name of the plugin, not an example of poor grammar), and advertising is superbly integrated. Once again, the search engine optimization is well implemented, with schema support and clean SEO-ready coding. 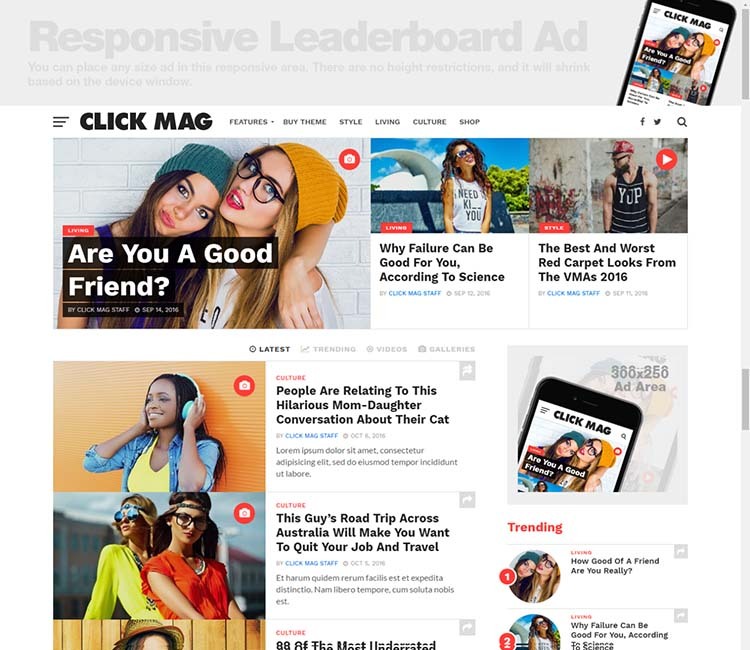 Click mag is 100% responsive and retina-ready, so it’s going to look pretty sweet on everything from iPhones to high-resolution monitors. YouTube and Soundcloud are also supported. Usability features like infinite scrolling and mega menus are a nice touch, and photo heavy websites will appreciate the superior gallery content type. Bimber not only appears on another roundup, I also use it for another of my own websites. That’s high praise, because I’m fussy and cheap and usually design my own. Bimber is marketed as a viral magazine theme which is, of course, essentially what gossip and celebrity blogs are–and it comes with a few different presets for different looks. There’s also a cool plugin that will allow visitors to submit their own content if that’s something you’re into. Webmasters can create lists, cool badges for popular trending posts, and paginated posts with big, bold navigation. (Squeeze page views out of your visitors!) The social media and sharing features are strong here, and powered by the MashShare plugin. Great advertising functionality rounds out the features. The theme also supports MailChimp for promoting and building your mailing list. Cuckoo, our next election, won us over with simplicity and usability. Performance is snappy, and navigation and UX are straightforward and intuitive. The theme is a joy to use. And of course, it looks great. The team behind Cuckoo was very likely inspired by the success of Bimber. The theme features front-end submission, and Visual Composer for when you want to assemble a few complex layouts. Cuckoo supports Upvoting and downvoting , and the trending posts plugin engages your visitors with your hottest content. With Cuckoo, you can also build a robust community using the BuddyPress and bbPress integration provided. The theme additionally supports MailChimp for mailing list promotion and sign-ups. Advertising features and search engine optimization are excellent on this one too. There’s plenty of options on the back-end, so you can really get in there to tweak, adjust, and ruin everything. 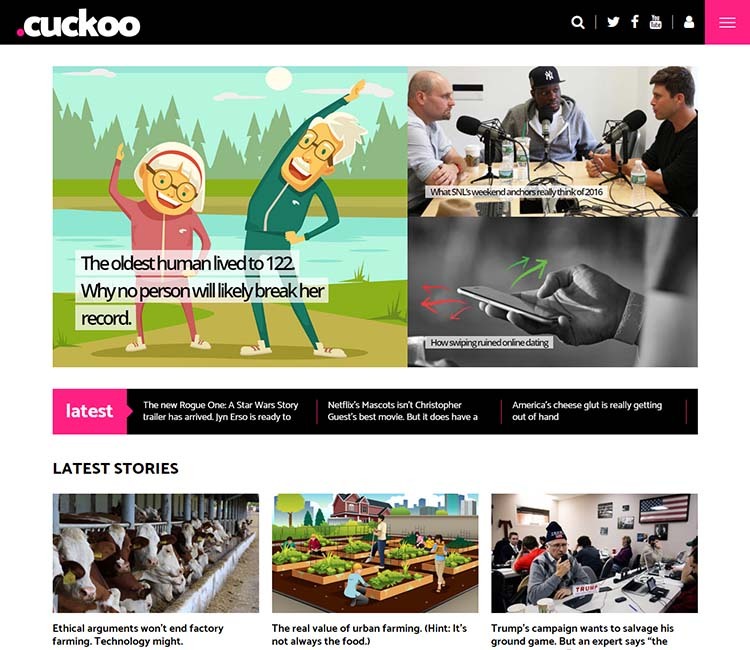 Cuckoo is responsive, as you’d expect, and looks sharp on high-resolution displays. A couple of usability features like front-end login and AJAX filtering add a bit more zing. This one deserves a bit more attention IMHO. Bourz aims at being a bit more stylish and fashionable than the other themes we’ve looked at so far. 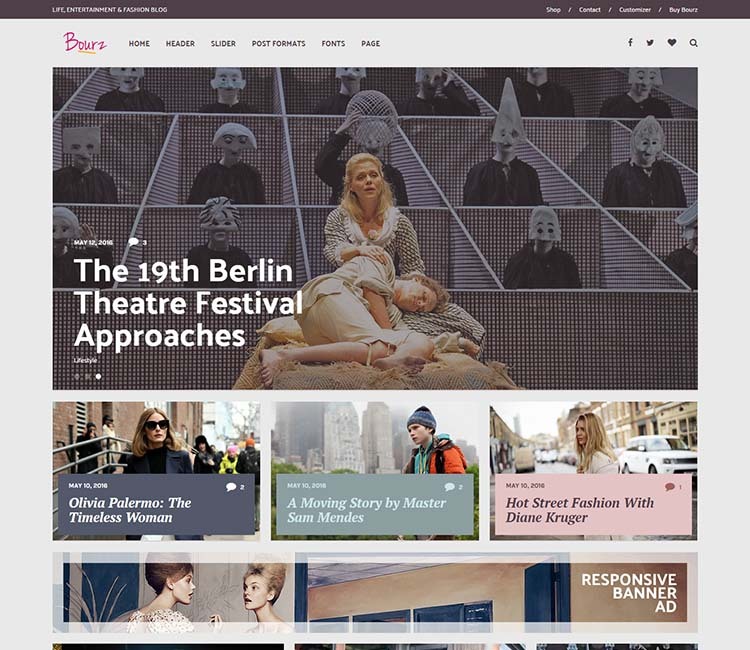 Although I’m not using this one on any of my sites, I do use another popular theme from the same development team, and Bourz reaches the same level of quality. Mobile-friendly design makes for an excellent, consistent user experience across the range of devices. Seven layout options provide versatility. A banner and advertising system is integrated and WooCommerce is supported for shopping cart functionality. Got some merch to pimp? You can sell it online using this theme. Unsurprisingly, there’s lots of useful options in the admin. Webmasters have control over colors, fonts, and more. This theme is fast and optimized for Google. Continuing in the direction of viral themes, the overtly titled ViralWP is another excellent choice for any celebrity and gossip magazine theme. I suppose this one is in the vein of Bimber and Cuckoo. Just a quick glance the demo reveals a similar aesthetic and feature set. All the must haves are here, like advertising features, MailChimp integration, social sharing functionality, and a nice set of options in the admin. We’ve written about a good life before, and will no doubt write about it again. This one shows up in a few of our articles because it’s a multi-concept magazine theme with presets and demos crafted & tailored for specific niches. The default style works for celebrity and gossip websites, and the fashion-centric style is easily adapted as well. The layout is flexible, with five different article layouts to choose from, and four gallery and video pages to work with. This one comes with a nice group of premium add-ons, too. A nice bonus. Ad spots are built-in, and accessible via Visual Composer. The code is optimized and fast, and supports Google structured data, making it another great choice for SEO. A good value overall and worth a closer look. Finally we have Mag, a chic and stylish design conceived for fashion, celebrity and entertainment magazines. Slider Revolution and Visual Composer are bundled. The code is properly structured for search engines, so you can score a good placement on Google, assuming all your other search engine optimization efforts measure up. Several custom sidebar widgets are built-in. Social sharing is well implemented. Mag supports WooCommerce, providing shopping cart functionality, and MailChimp for newsletter sign-ups. Retina ready and translation ready with WPML support. Of course, there are lots of options to play with in the admin, to get everything just how you like it. PrimaMag is a dynamic template that will become your amazing assistant in creating an entertainment magazine. You can choose between 10+ creative homepage layouts. All of them will capture your attention with their well-organized structure and focus on the content. In order to engage the masses, take advantage of the wonderful Revolution Slider. It allows creating eye-catching carousels and sliders that will highlight the latest updates. Everyone can get familiar with the hottest gossips. An excellent WMPL-functionality will make it possible to translate your website into various languages. Do not forget about a marvelous contact form that will allow users to get in touch with your team. An exciting template that will make everyone become amazed by your website. There will be no person who will be able to choose another gossip magazine to get familiar with the latest news. It will take you only one click to import all demo data. In order to give your website the most stylish look, take advantage of the powerful WordPress Live Customizer. It allows playing around with your design and viewing changes in a live-mode. Just change color and typography options and make people adore your website. You will also get four blog listing layouts. Among them, you can find such variations as a masonry, grid, list, and standard one. Sprout is a resourceful and sophisticated template that will provide you with everything you need to get a gossip magazine on the web. Its fully-responsive layout will make sure that everyone will be able to keep abreast of the latest news. You will get multiple custom widgets that will also be extremely helpful for you. Among them, you are going to find an author, post, featured post, and social widget. Furthermore, this ready-made solution has a highly-customizable nature. This means that you will be able to work with headers, footers, colors, fonts, and other website elements. Do not forget to play around with content layouts and choose between standard, list, grid and masonry ones. This is a fashionable template that will certainly catch the eye of your target audience. It comes together with a great set of useful tools in terms of getting a popular blog or news website. A mobile-first design will make it possible for people to use different devices in order to view your content. Thanks to a marvelous Elementor Page Builder, you can get an online-project with a tailor-made appearance. Make use of the wide variety of well-designed modules to work with all possible aspects of your design. In addition to this, you can take advantage of eye-catching images included in the package instead of searching relevant images on the Internet.